Here is the blank to start with. 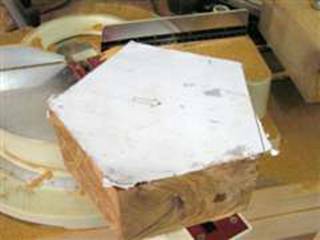 This is a piece of Olive that measures 9” (200mm) in diameter and 3¼” (80mm) thick. The blank does not need to be round it can be any shape. Here I have created a pentagon using MS Visio on my PC. Note the arrow added to the print out to show the centre of the pentagon. 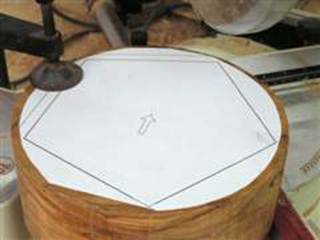 The template is temporarily glued to the blank using spray mount adhesive and the centre of the shape is marked using an awl. Here the blank is on my chop saw. Using the laser I line the blade up with the line of the pentagon on one side of the template. Now all you need to do is cut the first side. Rotate the blank check that the laser is still on the line and the saw hasn’t moved, mine occasionally does as depending on the number of sides as you may not be exactly on a locking indent. Here the blank is trimmed to shape and ready for mounting on the lathe. As you can see the paper can tear as the chop saw cuts. This is not a problem as it is the laser line that matters. This cutting stage is important and accuracy is the key. If all the sides are not the same length you can end up with a lop sided pentagon and uneven rim thickness. I use a faceplate ring that fits on the jaws on one of my chucks. This particular one has an inside diameter of 50mm. 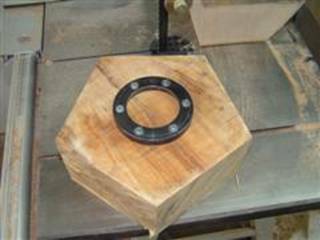 I use this type of ring so that I don’t have to change the chuck as it is important that everything registers or you can end up with a lopsided bowl. Here the blank is mounted on my lathe. I pivot the head out 22.5 degrees so that I can have full unrestricted access to the base of the bowl. I typically turn these type of bowls at 750rpm but you should use whatever lathe speed you are most comfortable with. 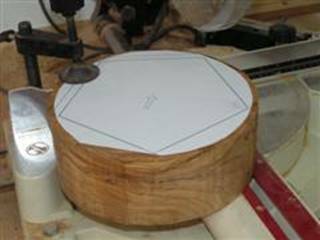 Here I have started to turn the outside shape of the bowl. I find that a concave shape seems to work best. 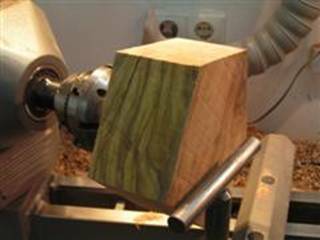 I use a 3/8” bowl gouge regardless of the blank size. The reason for this is that you should only take light cuts as you go around the shape particularly as you come off the outside with the cut. If you are too aggressive at this stage you can chip large splinters out of the side of the bowl that can make the blank useless. So gentle thin cuts with a sharp gouge are the order of the day here. You can hear the change in cutting noise as you start to cut air near the edge. This is the time to slow up the gouge movement and ensure that you continue to ride the bevel and don’t press or you will ripple the points. This will mean much more sanding later. I always use a push cut as I find that a pull cut is too aggressive at the points. Here the outside of the bowl is completed. The spigot for the chuck has been turned and the outside of the bowl is ready for sanding. I usually power sand the outsides of these bowls but care is needed. Ensure that the sanding pad is tilted at least 25 degrees from the vertical to ensure that you don’t snag the points. If you are not happy about power sanding you can sand by hand but watch the points. 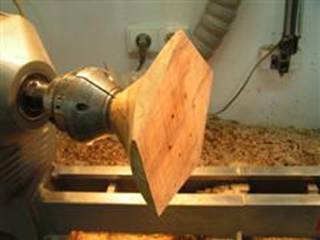 I lock the spindle at this stage and mark the 6 o’clock position on the chuck spigot. 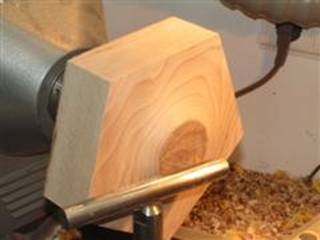 Here I have turned the bowl over and mounted the spigot in the chuck so that the mark is now in the 12 o’clock position. The reason for this is to make up for any slight offset of the chuck. 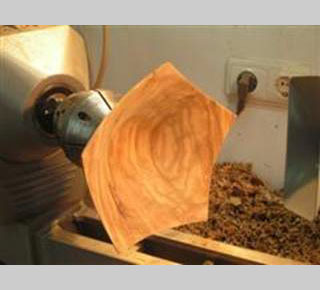 Having removed the faceplate ring and the bowl is ready for hollowing the inside. Here the centre has been hollowed out. The way that I do this is to first remove about 10mm (3/8″) from the centre of the bowl. I do this as I find that it reduces the stress on the wings of the bowl. I then start cutting from the outside towards the centre in the usual manner, leaving the bulk of the waste in the centre of the bowl. It is important to take light cuts and not to try to remove too much wood in one go when you are cutting the wings. I recommend cutting the outside to thickness at about 13mm (½”) depth at a time so that there is still plenty of support from the wood below. At the wings you are cutting air for some of the time, it helps if you have a black background below the bowl so that you can see the ghost image and this helps get an even thickness. I have black rubber tiles on the floor beneath my lathe and find that I don’t need anything else to see the ghost image. I only use an Irish ground 3/8” bowl gouge for this stage. 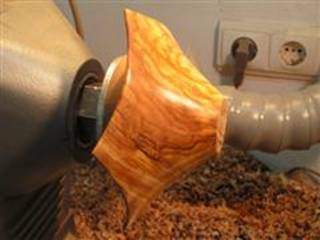 If the wood is particularly flexible I have used a ¼” Irish ground bowl gouge for the outer edge. If you feel confident you can gently support the outer edges of the wings, with the fingers of your tool rest hand, to give the wings additional support. The bowl is now ready for sanding the inside. 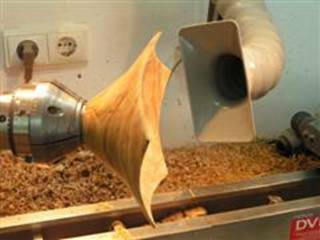 I usually power sand the solid section of the bowl and carefully hand sand the wings of the bowl. The better finish off the gouge the less sanding there is to do so tool technique is important. I do not recommend power sanding the outer edges of the bowl as they are so thin and small that it is too easy to sand away the tips and destroy the look of the bowl. 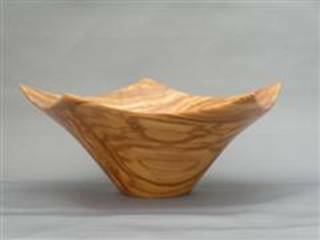 With all sanding operations on these type of bowls be careful as the wings are sharp and can cause serious injury. Now you are on the finishing straight. This piece of Olive, unfortunately, had some small checks in it (typical of Olive) that can be seen on this edge of the rim. The rim now needs sanding through the grits by hand to round over the edge. Even though this bowl is only 1/8” (3mm) thick it still looks thick, this is the reason for rounding the edge over. This creates the optical illusion of an even thinner bowl. This edge has been sanded round and the edge below has yet to be sanded. This photo whilst not the best in the world I hope conveys what I am saying. Depending on the type of finish being used you can now apply finish or leave it until after it has been removed from the lathe. Here the bowl has been reversed onto my vacuum chuck for the removal of the spigot. If you don’t have a vacuum chuck then I suggest a suitably shaped mandrel and the tail stock in the awl hole marked at the beginning. The bowl is now finished and ready for a signature on its base. Here is the finished bowl from this photo series. 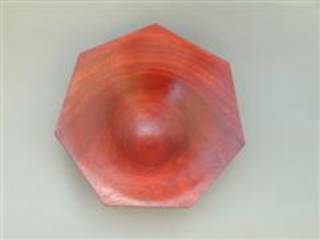 This is a heptagonal or seven sided bowl, made using the same technique described above, made in Palo Rojo. 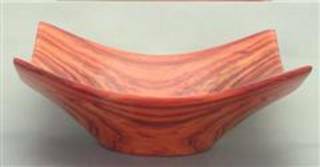 This is a square bowl made the same way in Palo Rosa. 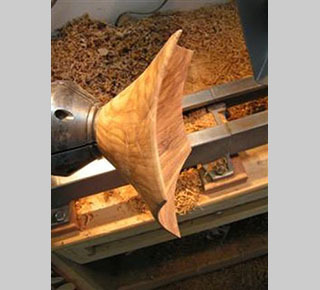 This is the way that I turn these types of bowls, I am certain that there are other ways of making them. You don’t have to start with round blanks, this is just what I had available, there is less wastage if you start with a square blank. 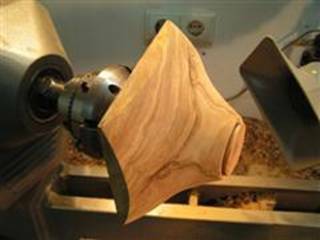 Please be aware that woodturning can be dangerous and that you follow these instructions at your own risk. I have created a pdf template of these shapes and you can download it here.